By Elizabeth Verdick, Elizabeth Reeve, M.D. Free Spirit Publishing, 9781575423852, 240pp. Elizabeth Verdick has been writing books since 1997, the year her daughter was born. Her two children, now ages 14 and 10, are the inspiration for nearly everything she writes. 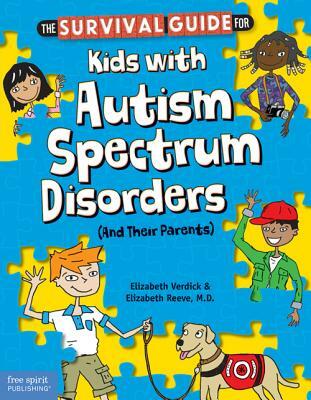 In this survival guide, she writes from the perspective of a mother with a son on the spectrum and a passionate advocate for kids and parents in the autism community. She is the author of books in several Free Spirit series including Toddler Tools™, Best Behavior™, Laugh & Learn™, and Adding Assets for Kids. Elizabeth lives with her family and five pets near St. Paul, Minnesota. Elizabeth Reeve, M.D., contributes not only her medical knowledge, but also her experiences as a mother of a son who has autism. Her clinical work focuses primarily on children and adults with developmental disabilities, and she has worked with many community organizations providing services to this population. In addition to her research and patient care, she is involved in teaching on a daily basis, regularly speaks in the community to educate others in the field of developmental disabilities, and stays up-to-date on this ever-changing field. Her recent endeavors focus on transition issues for young adults with ASDs as they enter college and the work force. She currently works in St. Paul and lives in Minneapolis, Minnesota.